ABSTRACT This article shows how the Netherlands, Denmark and Germany have made bicycling a safe, convenient and practical way to get around their cities. The analysis relies on national aggregate data as well as case studies of large and small cities in each country. The key to achieving high levels of cycling appears to be the provision of separate cycling facilities along heavily travelled roads and at intersections, combined with traffic calming of most residential neighbourhoods. Extensive cycling rights of way in the Netherlands, Denmark and Germany are complemented by ample bike parking, full integration with public transport, comprehensive traffic education and training of both cyclists and motor-ists, and a wide range of promotional events intended to generate enthusiasm and wide public support for cycling. In addition to their many pro-bike policies and programmes, the Netherlands, Denmark and Germany make driving expensive as well as inconvenient in central cities through a host of taxes and restrictions on car ownership, use and parking. Moreover, strict land-use policies foster compact, mixed-use developments that generate shorter and thus more bikeable trips. It is the coordinated implementation of this multi-faceted, mutually reinforcing set of policies that best explains the success of these three countries in promoting cycling. For comparison, the article portrays the marginal status of cycling in the UK and the USA, where only about 1% of trips are by bike. Cycling was not always thriving in the Nether-lands, Germany and Denmark. Cycling levels plummeted in all three countries from about 1950 to 1975 (Dutch Bicycling Council, 2006). It was only through a massive reversal in transport and urban planning policies in the mid-1970s that cycling was revived to its current successful state. In 1950, cycling levels were higher in the UK than they are now in Germany: almost 15% of all trips. Just as in these other countries, cycling in the UK plummeted from 1950 to 1975, but British cycling never recovered. It continued to fall to its current level of 1.3% of trips, only slightly higher than the 0.9% bike share of trips in the USA (U.S. Department of Transportation, 2003; Department for Transport, 2007). While history, culture, topography and climate are important, they do not necessarily determine the fate of cycling. Government policies are at least as important: transport policies, land-use policies, urban development policies, housing policies, environmental policies, taxation policies and parking policies. In many respects, the UK and the USA have given the green light to the private car, almost regardless of its economic, social and environmental costs. In sharp contrast, cycling has prospered in the Netherlands, Germany and Denmark over the past three decades precisely because these countries have given the red light, or at least the yellow warning light, to private cars. Instead of catering to ever more motor vehicles by expanding roadways and parking facilities, Dutch, German and Danish cities have focused on serving people, making their cities people-friendly rather than car-friendly, and thus more liveable and more sustainable than American and British cities. There are many good reasons to encourage more cycling. It causes virtually no noise or air pollution and consumes far less non-renewable resources than any motorized transport mode. The only energy cycling requires is provided directly by the traveller, and the very use of that energy offers valuable cardiovascular exercise. Cycling requires only a small fraction of the space needed for the use and parking of cars. Moreover, cycling is economical, costing far less than both the private car and public transport, both in direct user costs and public infra-structure costs. Because it is affordable by virtually everyone, cycling is among the most equitable of all transport modes. In short, it is hard to beat cycling when it comes to environmental, social and economic sustainability. Consequently, both the European Union (EU) and the USA have officially recognized the importance of cycling as a practical mode of urban transport and endorse the dual objectives of raising cycling levels while increasing cycling safety (U.S. Department of Transportation, 1994, 2004; European Conference of the Ministers of Transport, 2004). Figure 1. Bicycle share of trips in Europe, North America and Australia (percentage of total trips by bicycle). Figure 2. Kilometres cycled per inhabitant per day in Europe and the USA. Figure 3. Bike share of trips in selected cities in the Netherlands, Denmark, Germany, the UK, Canada, the USA and Australia (2000-2005). Note: UK data are for counties. One can view the same information in another light. 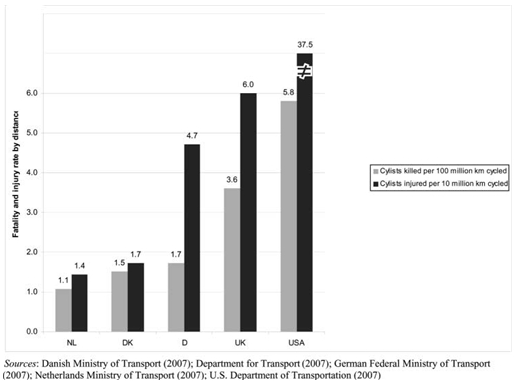 As shown in Figure 5, car ownership per capita has increased in the Netherlands, Denmark and Germany over the past few decades but remains much lower than in the USA. That is partly due to high taxes on car ownership and use in most European countries. But it is also due to excellent alternatives to the private car in the Netherlands, Denmark and Germany, including cycling as well as walking and public transport. As is most evident in Denmark and the Netherlands, safe and convenient cycling reduces the need for car ownership. Figure 4. 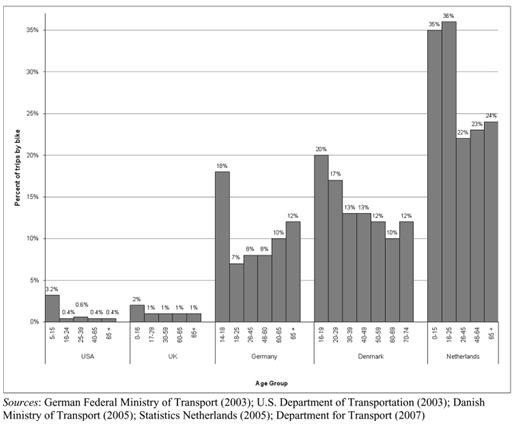 Bicycling share of short trips in the Netherlands, Denmark, Germany, the UK and the USA (2000-2005). Figure 5. Trend in car and light truck ownership per 1000 population in the USA, Germany, the UK, the Netherlands and Denmark (1970-2005). Figure 6. Trend in kilometres cycled per inhabitant per year in the Netherlands and the UK (1952-2006) (percent relative to 1950 levels). Figure 7: Trend in kilometres cycled per inhabitant per day in the Netherlands, Denmark, Germany, and the UK (1978-2005). Figure 8. Women’s share of total bike trips in Australia, the USA, the UK, Canada, Denmark, Germany and the Netherlands (2000-2005). Figure 9. Bicycling share of trips by age group in the USA, the UK, Germany, Denmark and the Netherlands (2000-2002). Perhaps the most important reason for the higher levels of cycling in the Netherlands, Denmark and Germany—especially among women, children and the elderly—is that cycling is much safer there than in the USA and the UK. Figure 10. Fatality rates and non-fatal injury rates in the Netherlands, Denmark, Germany, the UK and the USA (2004-2005). Figure 11. 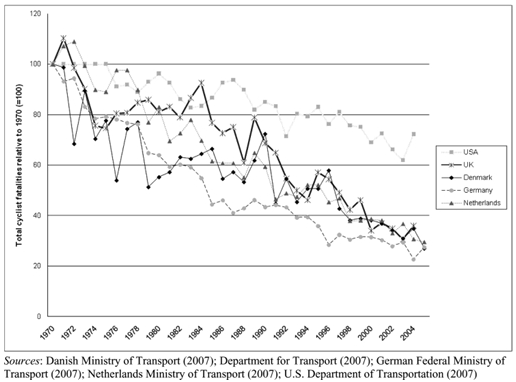 Trend in cycling fatalities in the USA, the UK, Denmark, Germany and the Netherlands (1970-2005) (percentage relative to 1970 level). Figure 12. 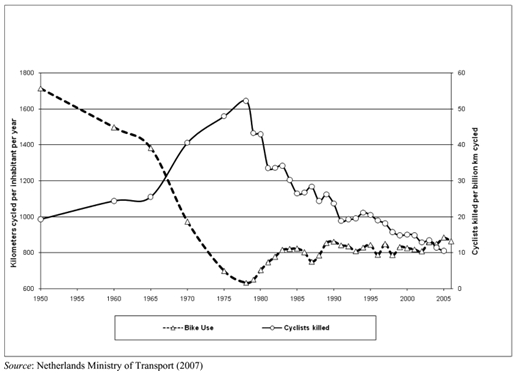 Inverse trends in cycling fatality rates and annual kilometres cycled per inhabitant in the Netherlands (1950-2005). There is also reason to believe that more cycling facilitates safer cycling. The phenomenon of ‘safety in numbers’ has consistently been found to hold over time and across cities and countries. Fatality rates per trip and per km are much lower for countries and cities with high bicycling shares of total travel, and fatality rates fall for any given country or city as cycling levels rise. Most surveys show that the perceived traffic danger of cycling is an important deterrent to more widespread cycling. Women and the elderly appear to be especially sensitive to such traffic danger. Many American parents do not allow their children to cycle for the same reason. In the USA, much of the effort to improve cyclist safety has focused on increasing helmet use, if necessary by law, especially for children. Thus, it is important to emphasize that the much safer cycling in northern Europe is definitely not due to widespread use of safety helmets. On the contrary, in the Netherlands, with the safest cycling of any country, less than 1% of adult cyclists wear helmets, and even among children, only 3-5% wear helmets. The Dutch cycling experts and planners interviewed for this article adamantly oppose laws to require the use of helmets, claiming that helmets discourage cycling by making it less convenient, less comfortable and less fashionable. They also mention the possibility that helmets would make cycling more dangerous by giving cyclists a false sense of safety and thus encouraging riskier riding behaviour. At the same time, helmets might reduce the consideration motorists give cyclists, since they might seem less vulnerable if wearing helmets. German and Danish cycling planners seem far more supportive of increased helmet use, especially among children. There have been extensive promotional campaigns in these two countries to encourage more helmet use, but there are no laws requiring helmet use, not even for young children. Due to the mostly local, short-distance trips made by bike, policies and programmes to promote safe and convenient cycling are usually carried out at the municipal level. Local governments in the Netherlands, Germany and Denmark have been planning, constructing and funding bicycling facilities for many decades, at least since the 1970s but much earlier in some cities. Municipalities are responsible for making the specific plans that reflect the particular conditions and needs of the local context. Cycling training, safety and promotional programmes are usually carried out at the local level as well, even if they are mandated and funded by higher levels. At the intermediate level, states, counties and regional governments provide additional policy guidance, coordination and funding, as well as some direct planning and construction of cycling facilities that serve rural areas or provide links between municipalities. Central government involvement in cycling has been more recent, evolving gradually since about 1980 and providing overall goals, design guidelines, research support, model projects, coordination and funding. The Netherlands, Denmark and Germany all have official National Bicycling Master Plans. Each of these plans sets forth the overall goal of raising levels of cycling for daily travel while improving cycling safety. They also propose various strategies to achieve these dual goals: better design of lanes, paths and intersections; more and better bike parking; coordination with public transport; and cycling safety and promotion campaigns. Although the Master Plans vary from one country to another, they generally focus on the federal government’s role in fostering research, dissemination of best practice information, and funding and evaluation of a wide range of experimental, innovative projects. Federal governments usually bear the cost of bicycling facilities built along national highways and contribute significantly to financing long-distance bicy-cling routes that cross state boundaries. In Germany, for example, the federal government contributed over €1.1 billion to doubling the extent of bikeways along federal highways from 1980 to 2000, and is now devoting €100 million per year for further bikeway extensions, cycling research and demonstration projects. In addition, about €2 billion a year in revenues from the motor fuel tax are earmarked for a special urban transport investment fund, which provides 70-85% federal matching funds for state and local governments wanting to build cycling facilities (paths, lanes, bridges, traffic signals, signs, parking, etc.). From 1990 to 2006, the Dutch Central Government contributed an average of €60 million per year to various cycling projects, including €25 million per year specifically for bike parking at train stations. In addition, the Dutch Central Government provides €1.8 billion a year for provinces to spend on transport projects, including cycling facilities. By comparison, the Danish Central Government has no regular funding for cycling projects but since 2000 has contributed about €2 million a year to various demonstration projects. Many policies and programmes are necessary to make cycling safe and feasible for a broad spectrum of the population. Table 1 summarizes seven categories of measures that have been widely adopted in Dutch, Danish and German cities. Their success in making cycling so appealing is largely attributable to the coordinated implementation of all of these measures, so that they reinforce the impact of each other in promoting cycling. Indeed, that is perhaps the key lesson to be learned: the necessity of a coordinated, multi-faceted approach. Due to space limitations, we can only provide a few details to describe the nature and extent of the seven types of measures. The following discussion serves mainly to provide some representative examples of what Dutch, Danish and German cities have been doing to raise cycling levels and make it safer. Most of the information cited below was provided directly to the authors by bicycling coordinators and planners in the ministries of transport of the Netherlands, Denmark and Germany and in two case study cities in each country (Amsterdam and Groningen; Copenhagen and Odense; Berlin and Muenster). • Well-maintained, fully integrated paths, lanes and special bicycle streets in cities and surrounding regions. • Fully coordinated system of colour-coded directional signs for bicyclists. • Off-street short-cuts, such as mid-block connections and passages through dead-ends for cars. • Advance green lights for cyclists at most intersections. • Advanced cyclist waiting positions (ahead of cars) fed by special bike lanes facilitate safer and quicker crossings and turns. • Cyclist short-cuts to make right-hand turns before intersections and exemption from red traffic signals at T-intersections, thus increasing cyclist speed and safety. • Bike paths turn into brightly coloured bike lanes when crossing intersections. • Traffic signals are synchronized at cyclist speeds assuring consecutive green lights for cyclists (green wave). • Bollards with flashing lights along bike routes signal cyclists the right speed to reach the next intersection at a green light. • Traffic calming of all residential neighbourhoods via speed limit (30 km/hr) and physical infrastructure deterrents for cars. • Bicycle streets, narrow roads where bikes have absolute priority over cars. • ‘Home Zones’ with 7 km/hr speed limit, where cars must yield to pedestrians and cyclists using the road. • Large supply of good bike parking throughout the city. • Improved lighting and security of bike parking facilities often featuring guards, video-surveillance and priority parking for women. • Extensive bike parking at all metro, suburban and regional train stations. • ‘Call a Bike’ programmes: bikes can be rented by cell phone at transit stops, paid for by the minute and left at any busy intersection in the city. • Bike rentals at most train stations. • Deluxe bike parking garages at some train stations, with video-surveillance, special lighting, music, repair services and bike rentals. • Comprehensive cycling training courses for virtually all school children with test by traffic police. • Special cycling training test tracks for children. • Stringent training of motorists to respect pedestrians and cyclists and avoid hitting them Traffic laws. • Special legal protection for children and elderly cyclists. • Motorists assumed by law to be responsible for almost all crashes with cyclists. • Strict enforcement of cyclist rights by police and courts. Especially from the mid-1970s to the mid-1990s, separate facilities such as bike paths and lanes expanded greatly in all the three countries. Data for individual cities suggest continued expansion. The main focus now appears to be on improving the specific design of cycle paths and lanes to improve safety. In 2004, for example, Berlin (3.4 million inhabitants) had 860 km of completely separate bike paths, 60 km of bike lanes on streets, 50 km of bike lanes on sidewalks, 100 km of mixed-use pedestrian-bike paths and 70 km of combined bus-bike lanes on streets. Amsterdam (735,000 inhabitants) and Copenhagen (504,000 inhabitants) each have roughly 400 km of completely separate bike paths and lanes. Even much smaller cities, however, have extensive cycling facilities. For example, there are 320 km of bike paths and lanes in Muenster, Germany (278,000 inhabitants), over 500 km in Odense, Denmark (185,000 inhabitants), and over 420 km in Groningen, the Netherlands (181,000). The bicycling networks in all these cities include numerous off-street short-cut connections for cyclists between streets and traversing city blocks to enable them to take the most direct possible route from origin to destination. The result of such a wide range of facilities is a complete, integrated system of bicycling routes that permit cyclists to cover almost any trip either on completely separate paths and lanes or on lightly travelled, traffic-calmed residential streets. Not only has the network of separate cycling facilities greatly expanded since the 1970s, but also their design, quality and maintenance have continually improved to ensure safer, more convenient and more attractive cycling with each passing year. In addition, many cities in the Netherlands, Denmark and Germany have established a fully integrated system of directional signs for cyclists, colour-coded to correspond to different types of bike routes. That system of signage often extends to entire regions, states and even countries for long-distance. All large cities and most medium-sized cities in the Netherlands, Denmark and Germany provide detailed maps of their cycling facilities. Some cities have recently introduced Internet bike route planning to assist cyclists in choosing the route that best serves their needs. In Berlin and Odense, for example, cyclists can enter their origin and destination as well as a range of personal preferences, such as speed, on-street or off-street facility, avoiding intersections and heavy traffic, etc. The Internet programme shows the optimal route on a map and provides all relevant information about time, average speed, bike parking and public transport connections. This bike route planning is even possible while en route, using the LCD display of a mobile phone. The provision of separate cycling facilities is undoubtedly the cornerstone of Dutch, Danish and German policies to make cycling safe and attractive. They are designed to feel safe, comfortable and convenient for both young and old, for women as well as men, and for all levels of cycling ability. Separate facilities are not sufficient but they are certainly necessary to ensure that cycling is possible for a broad spectrum of the population. It is neither possible nor necessary to provide separate bike paths and lanes on lightly travelled residential streets, but they constitute an important part of the overall cycling route network. Thus, Dutch, Danish and German cities have traffic-calmed most streets in residential neighborhoods, reducing the legal speed limit to 30 km/hr and often prohibiting any through traffic. In addition, many cities—especially in the Netherlands—introduced considerable alterations to the streets themselves, such as road narrowing, raised intersections and crosswalks, traffic circles, extra curves and zigzag routes, speed humps and artificial dead-ends created by mid-block street closures. Cycling is almost always allowed in both directions on all such traffic-calmed streets, even when they are restricted to one-way travel for cars. That further enhances the flexibility of bike. The most advanced form of traffic calming—the ‘woonerf’ or ‘Home Zone’— imposes even more restrictions, requiring cars to travel at walking speed. Pedestrians, cyclists and playing children have as much right to use such residential streets as motor vehicles; indeed, motor vehicles are required to yield to nonmotorized users. In the Netherlands, Denmark and Germany, traffic calming is usually areawide and not for isolated streets. That ensures that thru-traffic gets displaced to arterial roads designed to handle it and not simply shifted from one residential street to another. Related to traffic calming, almost every city has created extensive car-free zones in their centres, mainly intended for pedestrian use but generally permitting cycling during off-peak hours. In some Dutch cities, these car-free zones specifically include cycling facilities such as bike lanes and parking. The combination of traffic calming of residential streets and prohibition of cars in city centres makes it virtually impossible in some cities for cars to traverse the city centre to get to the other side. Cars are forced to take various circumferential routes instead, thus mitigating the congestion, pollution and safety problems they would cause in dense city centres. Another kind of traffic calming is the so-called ‘bicycle street’, which has been increasingly adopted in Dutch and German cities. These are narrow streets where cyclists are given absolute traffic priority over the entire width of the street. On normal streets, cyclists are usually expected to keep as far to the kerb (or lane of parked cars) as possible, so as not to interfere with motor vehicle traffic. On bicycling streets, however, cyclists can ride anywhere they want, even if that means obstructing cars. Cars are usually permitted to use the streets as well, but they are limited to 30 km/hr (or less) and must yield to cyclists and give special consideration to avoid endangering them. In Muenster, for example, there were already 12 bicycling streets in 2007, and they have been so successful that the city has plans to add another 10 bicycling streets in the coming years. Traffic calmed residential neighborhoods, car-free city centres, and special bicycle streets all greatly enhance the overall bicycling network in Dutch, Danish and German cities. Most importantly, they offer much safer, less stressful cycling than streets filled with fast-moving motor vehicles. Since most bike trips start at home, traffic calming of neighborhood streets is crucial to enabling bike trips to start off in a safe, pleasant environment on the way to the separate bike paths and lanes that serve the rest of the trip. The available empirical evidence shows that traffic calming improves overall traffic safety. The benefits tend to be greatest for pedestrians, but serious cyclist injuries also fall sharply. Moreover, most studies report large increases in overall levels of walking and cycling. There are, of course, many different kinds of traffic calming. It is conceivable that one or another specific kind of traffic calming measure (perhaps roundabouts or speed humps) might detract from cycling safety in some circumstances. Overall, however, the evidence is overwhelming that traffic calming enhances both pedestrian and cyclist safety by reducing speeds on secondary roads. ● realigning bike pathways a bit further away from their parallel streets when they approach intersections to help avoid collisions with right-turning cars. Given the very nature of roadway intersections, it is virtually impossible to avoid all conflicts between motor vehicles and cyclists, but Dutch, Danish and German planners have done a superb job of minimizing these dangers. Extensive bike parking of various sorts is available throughout most Dutch, Danish and German cities. Local governments and public transport systems themselves directly provide a large number of bike parking facilities. Moreover, private developers and building owners are required by local ordinances to provide specified minimum levels of bike parking both within and adjacent to their buildings. Aside from the large number of bike racks throughout these cities, the most visible and most innovative aspect of bike parking policy is the provision of state-of-the-art parking facilities at train stations. Immediately adjacent to Muenster’s main train station, for example, there is a modern, attractive ‘bike station’ (built in 1999) that offers secure, indoor parking for 3300 bikes as well as bicycle sales, repairs, washing, and cycling touring services. The station has direct access to all train platforms. Amsterdam, Groningen and Odense offer similar, high-capacity bike parking facilities at their main train stations. Moreover, virtually every train station throughout Dutch, Danish and German metropolitan areas offers bike parking of some sort. In the Berlin region, there were 24,600 bike-and-ride parking spots at train stations in 2005 (including metro, suburban rail and regional rail), with 7,000 additional bike parking spots planned by 2010. Many city centres also offer special bike parking facilities. The City of Odense, for example, recently added 400 sheltered bike racks near its main shopping area as well as a state-of-the-art automatic, secure parking station. Groningen offers 36 major bike parking facilities in its town centre, including seven that are guarded to prevent bike theft. Amsterdam has 15 guarded bike parking facilities in its downtown shopping area. In 2007, Muenster added a secured, indoor parking facility for 290 bikes adjacent to its main shopping district. The City of Copenhagen installed 3,300 bike parking spaces in the town centre to facilitate cycling for shopping and entertainment trips. Clearly, the provision of convenient, secure, sheltered bike parking is essential to cyclists, just as car drivers need parking for their cars. The current policy focus in Dutch, Danish and German cities is to increase the security of bike parking, since bike theft is a major problem. The random parking of bikes in public spaces can obstruct pedestrians on sidewalks and is considered by some to be a visual eyesore. Thus, the supply of bike parking is being expanded not only for greater cyclist convenience but also to deal with the clutter of randomly parked bikes. Somewhat similar to car parking in the USA, there never seems to be enough bike parking. In spite of Muenster’s superb bike parking facility at the main train station, for example, there are still over 10,000 bikes parked in the nearby sidewalks, plazas and alleys, and most of those are not in racks. Most Dutch, Danish and German cities have integrated cycling with public transport. Public transport companies and city planners in northern Europe have increasingly recognized the key role that bicycling plays as a feeder and distributor service for public transport. Thus, copious bike parking is provided at train stations in the city centre as well as at outlying stations along the rail network. In cities such as Muenster, many suburban residents use a bike to reach the nearest suburban rail station, park it there, and then take the train to the city centre, where they continue their trip with another bike they have parked at the main train station. Most rail systems charge an additional fee for cyclists to take their bikes on suburban trains, metros and trams. Moreover, many systems prohibit bikes on vehicles during rush hours, and even if permitted, it can sometimes be less convenient than keeping bikes at parking facilities at both ends of the trip. Most Dutch, Danish and German cities we surveyed do not permit bikes to be taken onboard regular city buses, and most buses do not come equipped with bike racks. That contrasts starkly with the USA, where over 50,000 urban transit buses in 2007 had bike racks to facilitate bike and ride. It appears to be the one area where American transit systems do a better job of coordinating cycling with transit. The northern European approach is to provide bike parking facilities at major bus terminals, bus route interchanges and even some suburban bus stops. Bike-and-ride facilities at bus stops are not nearly as extensive, secure and comfortable as those at rail stations, but they help offset the lack of bike racks on buses. Another form of bike-transit integration is the provision of bike rentals at virtually every major Dutch, Danish and German train station and many suburban stations as well. The German Railways’ ‘Call a Bike’ programme in Berlin is especially innovative. It permits anyone with a mobile phone and credit card to rent one of more than 3,000 German Rail bikes placed all over the city. One simply calls up the ‘Call a Bike’ number, provides credit card information (charged per minute of bike use), and then receives the access code used to unlock the bike. The bike can be left at many different locations throughout the city instead of being returned to the point of origin. The same ‘Call a Bike’ service is offered by German Railways in other major cities such as Hamburg, Cologne, Frankfurt and Munich, with a total of over 10,000 such rental bikes. There is an even more extensive public transport bike programme in the Netherlands. In 2007, over a hundred Dutch railway stations provided quick and easy discount bike rentals, operated by OV-Fiets. Payment is made via a special account linked to a season ticket for public transport or a special OV-Fiets membership card. Dutch, Danish and German children receive extensive training in safe and effective cycling techniques as part of their regular school curriculum. Most children complete such a course by the fourth grade. It includes both classroom instruction and ‘on the road’ lessons, first on a cycling training track just for children and then on regular cycling facilities throughout the city. Real police officers test the children, who receive official certificates, pennants and stickers for their bikes if they pass the test. Since many children get to school by bike, training in safe cycling is considered essential to ensure their safety. But it also gets kids off to a lifetime of safe cycling skills. And since all school children are included, it means that girls as well as boys start cycling at an early age. Another crucial element in cyclist safety is training motorists to be aware of cyclists on the roadway and to avoid endangering them. In general, motorist training in the Netherlands, Denmark and Germany is far more extensive, more thorough, and more expensive than in the USA. Motorists are legally responsible for collisions with children and elderly cyclists, even if they are jaywalking, cycling in the wrong direction, ignoring traffic signals, or otherwise behaving contrary to traffic regulations. The priority legal status of non-motorists puts motorists on the defensive and forces them to drive with special attention to avoiding endangering cyclists and pedestrians. As suggested by the previous section, traffic laws in the Netherlands, Denmark and Germany give special consideration to the especially vulnerable situation of cyclists vis-א-vis motor vehicles. Thus, they generally require the motorist to make special efforts to anticipate potentially dangerous situations and pro-actively avoid hitting cyclists. Moreover, motorists are generally assumed to be legally responsible for most collisions with cyclists unless it can be proven that the cyclist deliberately caused the crash. Having the right of way by law does not excuse motorists from hitting cyclists, especially children and elderly cyclists. For the most part, traffic laws intended to protect cyclists and pedestrians from motor vehicles are far more strictly enforced by the police and courts in the Netherlands, Denmark and Germany than in the USA. Moreover, cyclists disobeying traffic laws are also more likely to be ticketed than in the USA. In combination with comprehensive and rigorous training of motorists and cyclists, the strict enforcement of traffic laws surely contributes to safer driving behaviour by motorists and safer cycling by cyclists. Although the provision of safe and convenient cycling facilities is the key approach to promoting cycling, virtually all Dutch, Danish and German cities have various programmes to stimulate interest and enthusiasm for cycling by all groups. Table 2 includes a partial listing of typical promotional measures used by six cities we specifically surveyed: Amsterdam and Groningen (Netherlands), Copenhagen and Odense (Denmark), and Berlin and Muenster (Germany). There were many other creative and interesting programmes as well, but Table 2 conveys the sorts of promotional measures undertaken. Promotional activities tend to be more extensive in Denmark and Germany than in the Netherlands, where cycling levels are already so high that the focus is more on safer cycling than on more cycling, although the two are directly related, as noted earlier. • Free use of distinctive, simple City Bikes parked throughout the city, as in Copenhagen. • Easy, convenient and inexpensive bike rentals at train stations and throughout the city, such as the ‘OV-Fiets’ and ‘Call a Bike’ programmes in the Netherlands and Germany, respectively. • Company bikes loaned for free to employees who can use them during the day for short business trips. • Tax breaks to purchase a bike in the Netherlands. • Convenient air pumps for bikes in city centre. •‘Park and Bike’: discount bike rentals for motorists who park their cars and bike for the rest of the journey. • Bicycling websites with extensive information for cyclists on bicycling routes, activities, special programmes, health benefits of cycling, bikes and bike accessories, etc. • Flexible Internet bike trip planning tool allows finding the most comfortable or quickest route by bike tailored to the specific preferences and needs of each person. • Comprehensive bike maps for most cities as well as most regions and states. • Special fun programmes for young children, such as the ‘Cycling Duckie’ in Odense, which distributes candy, balloons, free bike accessories and other gifts to children learning to cycle. • Cycling ambassador programmes that send well-trained cyclists to residential neighbourhoods to serve as role models of safe cycling and help with cycling promotion, distributing newsletters and information. • Annual bicycling festivals and car-free days that promote the environmental advantages of bicycling, display the latest bike models and accessories, and disseminate various other relevant information for bike enthusiasts. • Wide range of cycling competitions for different ages and skill levels. • Special guided bike tours for seniors. • Regular surveys of cyclists to assess their satisfaction with cycling facilities and programmes and to gather specific suggestions for improvement. • Bike councils that provide a platform for opinion exchange among stakeholders from businesses, the bike industry, the city administration, research institutes, universities, bike experts and citizen advocacy groups, such as the ‘Fahrrat’ in Berlin. Source: Information provided directly to authors by bicycling coordinators in the Netherlands, Denmark and Germany. Most of the above policies refer to measures that make cycling safer and more convenient. Many other important government policies encourage cycling indirectly. Several different categories of such complementary policies are listed in Table 3. For example, many Dutch, Danish and German cities impose a range of restrictions on car use, including limits on speeds, turns, direction of travel, and in some cases prohibit car use altogether, such as in car-free zones. Similarly, the provision of road capacity and parking facilities is far less generous than in American cities. Indeed, roadway and parking supply have been deliberately reduced in many Dutch, Danish and German cities over the past few decades in order to discourage car use in the city centre. The many restrictions on car use and parking reduce the relative speed, convenience and flexibility of car travel compared to cycling. Moreover, sales taxes on petrol and new car purchases, import tariffs, registration fees, license fees, driver training fees and parking fees are generally much higher in Europe than in the USA. That results in overall costs of car ownership and use two to three times higher in Europe. That higher cost discourages car use to some extent and thus promotes alternative ways of getting around, including cycling, which is surely one of the cheapest of transport modes. Finally, land-use and urban-design policies in Dutch, Danish and German cities are generally much stricter than in the USA and provide more government controls on low-density sprawl and the long-trip distances that usually generates. Moreover, mixed-use zoning and transit-oriented developments have a long history in Europe. They facilitate the proximity of residential areas to commercial establishments, schools, churches and a range of services. The resulting trip distances are shorter and thus more bikeable than those in the USA. For the most part, these complementary taxation, parking and land-use policies are not specifically intended to promote cycling. Nevertheless, they provide dramatically more favourable pre-conditions for cycling than in the USA. The situation in the UK appears to be far less favourable to cycling than in the Netherlands, Denmark and Germany. Interviews conducted by the authors in 2007 with a wide range of transport specialists throughout the UK suggest that British metropolitan areas have a greater supply of motorways and car parking than is typical of the Netherlands, Denmark and Germany. Car-free city centres are less common in the UK, traffic calming of residential neighbourhoods is far less widespread, speed limits are generally higher, and many firms provide financial incentives to buy cars and drive them to work. Moreover, land-use controls tend to be less strict than in the rest of northern Europe. The lack of good coordination between land-use and transport has resulted in more low-density suburban sprawl, often strewn along the extensive motorway system surrounding many British cities. Clearly, none of the above factors is conducive to cycling. Combined with the lesser extent and inferior quality of cycling facilities in most British cities, these unfavourable conditions might help explain why only slightly more than 1% of trips in the UK were made by bike in 2005. One interesting exception in the UK is the congestion pricing scheme in London since 2003, which has helped increase cycling levels by 30% (Transport for London, 2007a, b). Cycling in London has grown not only due to the restriction of car use but also by the simultaneous provision of expanded and improved cycling facilities. • Traffic calming of residential neighbourhoods limits cars to speeds of 30 km/hr or less. • ‘Home Zones’ in many neighbourhoods give cyclists and pedestrians equal rights to road use and limit cars to walking speed (about 7 km/hr). • Car-free zones, one-way streets and artificial dead-ends make car travel through the city centre slow and inconvenient. • Turn restrictions for cars but not for cyclists. • Almost no limited access highways (motorways) in city centres. • Strictly enforced speed limits and traffic rules in cities (such as police cameras at intersections). • Frequent random speed limit enforcement checks by the police. • Advance stop lines and traffic signal priority for cyclists. • Limited number of car parking places in city centres. • Parking management schemes limit easy car access to urban neighbourhoods, often with resident-only parking or strict time limits. • Replacing car parking facilities with bike parking instead. • Combined bus-bike lanes that permit bike use but prohibit car use. • Deliberately narrowed roads in city centres force cars to drive slowly. • Special bicycle streets that sharply limit car speeds and give cyclists priority in roadway use over the entire width of the road. • High taxes and fees on car purchase, ownership and use. • Especially high excise and sales taxes on petrol. • High hourly parking rates in city centre, even in medium-size cities. • Most land beyond already built-up areas is off-limits for new development. • Most new development occurs adjacent to already built-up areas, which keeps overall population densities high compared to the USA. • Transport and land-use planning are integrated at several levels of government, with regional coordination that fosters cooperation between adjacent communities. • Many local governments specifically require cycling and walking facilities for new suburban developments, thus reducing the need for car use. • Mixed-use zoning keeps trip distances short and feasible by bicycle and on foot. • Less strict separation of land uses than in the USA, thus enabling natural development of mixed-use neighbourhoods. The most important approach to making cycling safe and convenient in Dutch, Danish and German cities is the provision of separate cycling facilities along heavily travelled roads and at intersections, combined with extensive traffic calming of residential neighbourhoods. Safe and relatively stress-free cycling routes are especially important for children, the elderly, women and for anyone with special needs due to any sort of disability. Providing such separate facilities to connect practical, utilitarian origins and destinations also promotes cycling for work, school and shopping trips, as opposed to the mainly recreational cycling in the USA, where most separate cycling facilities are along urban parks, rivers and lakes or in rural areas. As noted in this article, separate facilities are only part of the solution. Dutch, Danish and German cities reinforce the safety, convenience and attractiveness of excellent cycling rights of way with extensive bike parking, integration with public transport, comprehensive traffic education and training of both cyclists and motorists, and a wide range of promotional events intended to generate enthusiasm and wide public support for cycling. Would such pro-cycling policies as those listed in Tables 1 and 2 be possible in a country like the USA? Some of the same policies are already used, but to a much lesser extent, in many American cities. Moreover, there has been considerable expansion of such measures in recent years, with even more expansion planned. Generous federal funding has helped finance 6,165 km of bike lanes, 3,483 km of multi-use bike-ped paths and 36,195 bike parking racks in the 50 largest U.S. cities. Bike parking at rail stations has been increasing, and as noted earlier, over 50,000 buses in the USA already come equipped with bike racks to facilitate bike and ride. Moreover, all states now have federally funded Safe Routes to School programmes designed to help children walk or bike to school. With the highest bike share of work trips (4%) of the 50 largest U.S. cities, Portland, Oregon, probably has the country’s most successful bicycling programme. Portland has more than tripled the total annual number of bike trips since 1991. That is partly due to a range of pro-bike measures such as vastly expanding its bikeway network, increasing bike parking and integrating cycling with bus and rail systems. In addition, bicycling in Portland benefits from the country’s most famous land-use planning reforms, which have restricted leap-frog suburban sprawl and encouraged compact, mixed-use development conducive to shorter, more bikeable trips. Portland has also reduced the supply of car parking in the city centre while improving public transport services. Very few American cities can boast of such an integrated range of policies to promote cycling. While Portland has been a model bicycling city, Chicago and New York provide some impressive examples of what can be done to promote cycling even in two megacities which for decades had been extremely hostile to cycling. In the past ten years Chicago has added over 160 km of bike lanes and paths, established a city-wide cycling network, installed 7,000 racks for bike parking and equipped over 2,000 buses with racks to encourage bike and ride. Moreover, the latest official bicycling plan calls for further expansion to create an 800 km bikeway network. New York has added 392 km of bike paths and lanes in the past ten years and plans an additional 900 km of bike paths and lanes in the coming ten years. From 2001 to 2007, New York installed over 3,000 new bike racks. Official city plans call for a network of 2,880 km of bike lanes and mixed-use greenway paths by 2030. Cycling levels in both Chicago and New York have increased considerably. Annual cordon counts conducted by the City of New York at a wide range of locations throughout Manhattan indicate that cycling levels more than doubled between 2000 and 2007. In short, such pro-bike ‘carrot’ policies are indeed possible even in a car-oriented country like the USA. 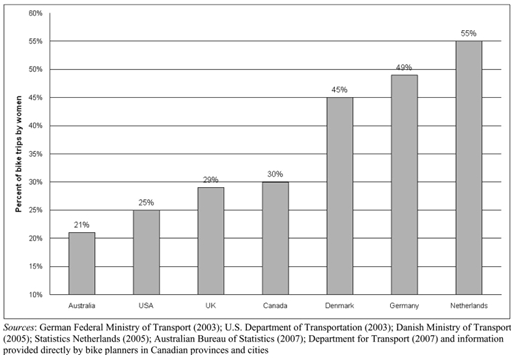 By comparison, there is almost no political support in the USA for adopting and implementing the sorts of car-restrictive ‘stick’ policies listed in Table 3 that indirectly encourage cycling in the Netherlands, Denmark and Germany. In those three countries, car use is far more expensive and much less convenient than in the USA due to a host of taxes and restrictions on car ownership, use and parking. Moreover, strict land-use policies foster relatively compact, mixed-use developments that generate more bikeable, shorter trips. Promoting cycling is surely not the main purpose of such policies, but they clearly provide important incentives and supportive conditions for cycling. With very few exceptions, such as Portland, Oregon, neither car-restrictive measures nor stringent land-use controls have yet been politically acceptable in American cities. The public and the media vigorously oppose even slight increases in the petrol tax, for example, and thus discourage politicians from even considering increased taxation on car use. Similarly, there is little support for restrictions on car parking, speeds and passage of cars through city centres and residential neighbourhoods. Thus, there appears to be only very limited potential for implementation in the USA of these crucial ‘stick’ approaches that would encourage cycling. Even in a city such as New York, where a majority of residents have no cars, it has been an uphill battle trying to approve the proposed congestion pricing scheme for Manhattan. It would involve a charge of $8 for cars and $21 for trucks to enter Manhattan south of 86th Street on weekdays between 6 am and 6 pm. Both Mayor Bloomberg (of New York City) and Governor Spitzer (of New York State) strongly support congestion pricing, and the U.S. Department of Transportation has offered $353 million in subsidy to help finance the programme. The plan remains highly controversial, however, and a combined state and city commission has been established to evaluate it. The federal government has set a deadline of 31 March 2008 for final city and state approval of the congestion pricing plan, and a deadline of 31 March 2009 for its implementation. Based on the London experience, it seems likely that congestion pricing in New York would increase cycling levels, especially since the city plans to greatly expand its cycling facilities at the same time. The key to the success of cycling policies in the Netherlands, Denmark and Germany is the coordinated implementation of the multi-faceted, mutually reinforcing set of policies summarized in Tables 1, 2 and 3. Not only do these countries implement far more of the pro-bike measures, but they greatly reinforce their overall impact with highly restrictive policies that make car use less convenient as well as more expensive. It is precisely that double-barrelled combination of ‘carrot’ and ‘stick’ policies that make cycling so irresistible. Source: Making Cycling Irresistible: Lessons from The Netherlands, Denmark and Germany.